Mary Vena was a loving wife, cherished mother and beloved grandmother. She entered the Gates of Heaven on April 5, 2019. She was born on November 18, 1928, in Los Angeles, California, to Natale and Luisa Gazano. Mary grew up in Los Angeles where she also attended Roosevelt High School. She met her husband, Louie, through family friends and they wed on August 22, 1948. The couple settled first in Los Angeles where they had their three children, Kathleen, Diane, and James. Her young family later moved and settled in Whittier. 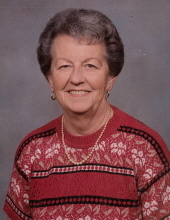 Mary was a dedicated homemaker to her family for over 32 years. After being widowed, Mary returned to school and became a bank teller until her retirement. After retiring she became very involved in the senior clubs of Parnell Park and also at St. Gregory’s Catholic Church, here in Whittier. It was through her participation that she gained many lasting friendships and engaged in hobbies such as, knitting/crocheting, bingo, gambling, and traveling. But most especially, she enjoyed going out for Taco Tuesday on a regular basis. Mary is survived by her brother, John Gazano and his spouse Bette; loving children, Kathleen, Diane, and James Vena; grandchildren, Ashlee Merriwether and her spouse Stephen Merriwether, Valiree Vena and her fiancé Taylor Bennett. To send flowers or a remembrance gift to the family of Mary Vena, please visit our Tribute Store. "Email Address" would like to share the life celebration of Mary Vena. Click on the "link" to go to share a favorite memory or leave a condolence message for the family.